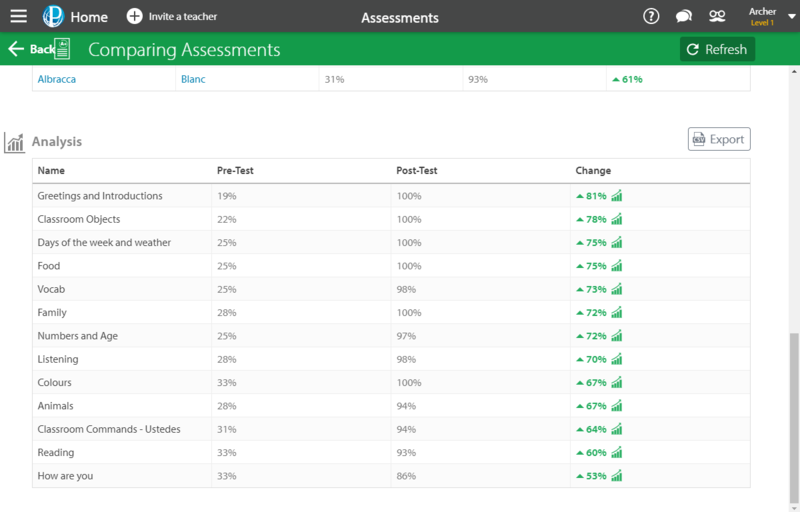 You can compare the results of any two assessments to track your students' learning growth. The comparison provides the most value if the two assessments you are comparing are similar, but you can compare any two assessments which are percentage-based. 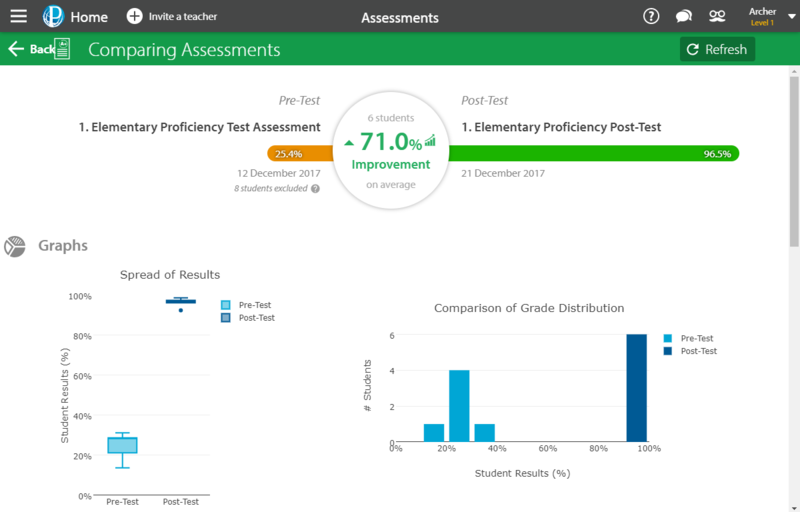 Open the Assessments section of your Control Panel and click on the Analysis section of the first assessment you want to compare. Choose the second assessment in the comparison. We show the overlap between the students in the task and the content of the assessment to give an indication of which comparisons will give useful results. The comparison report summarises the results for the group, the spread of results for the two tests, compares individual students' scores in the two tests, and compares the cohort's results on specific analysis tags or skills. The Group Result section compares the mean (average) results of the students in the assessment as a whole and indicates the level of improvement, including whether the improvement is statistically significant. Only students who completed both assessments are included in these results, meaning the average score may vary from what is shown on the analysis tab of one of the assessments individually. The Bar and Whisker Chart on the left shows the spread of student results across the class and compares these spreads across the two tests. Each section of the chart shows the range of scores for 25% of the cohort. Smaller segments indicate that the quartile of the cohort's scores were tightly grouped. For more information on how to interpret Bar and Whisker Charts, see here. The Comparison of Grade Distribution bar chart on the right shows how many students achieved each score band in the two tests, grouped into 5% increments. For each student, we compare their grades in the two tests and show the change in score between the two tests. Students who didn't complete both assessments are excluded from the table by default. Click Show All Students to include them. Questions in assessments can be tagged with specific skills which they assess. Any skills which are included in both assessments will be compared to show the change in students' understanding between the two tests. Skills only tested in one assessment are excluded from the table by default. Click Show All Analysis Groups to include them. As with the Group Results, changes which are statistically significant (p < 0.05) are shown with an icon.